Rane Sixty Four Performance Mixer DJParts - All Variety of Parts that DJ Needs. 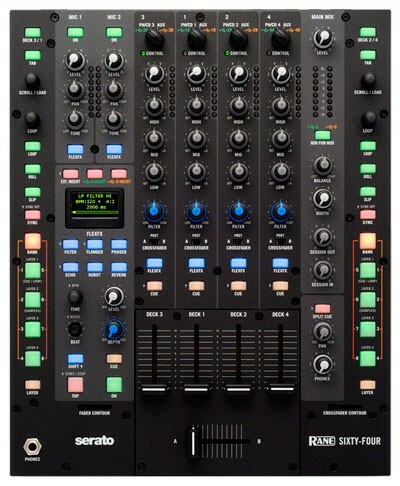 The Rane SIXTY-FOUR DJ Mixer offers everything a DJ needs to elevate his or her performance to new heights. It offers four channels which can easily be swapped between four line-level or phono-level sources, or between two USB sources. 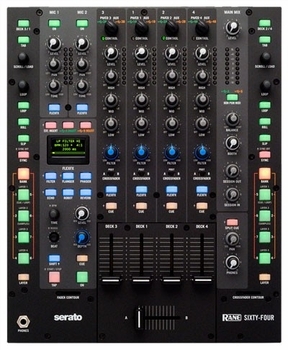 With such a plethora of connectivity options, the SIXTY-FOUR is also an ideal solution for anyone looking for a house mixer for their club or small venue. It's got onboard EQ, beat-synced effects, and all the controls you'd expect on a battlemixer, like cues, loops, samples, etc. It's also bundled with Serato DJ software, which provides all the tools a DJ needs whether you're a digital DJ, a turntablist, or both.